Home / Articles / Is Temperance Card A Bad Sign? In a very modern and fast living lifestyle that we have, it is all too easy to fall victim to a life of imbalance and excess. When the card of Temperance appears in your Tarot spread, it is a sign that you have found, or need to find, a middle path of moderation. It is a card that shows the balance between masculine and feminine energy and conscious knowledge and subconscious thought. This balance is a result of careful consideration and patience. The astrological sign of Sagittarius rules the card of Temperance, emphasizing tolerance, truth and beauty. The element of beauty is evident by the central figure of a winged angel standing in the center of the card. 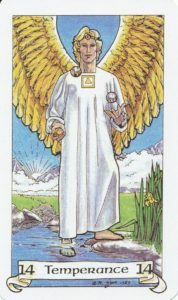 It’s also important to note that this particular angel is a hermaphrodite, a balance of feminine and masculine energies that is perfectly at home in the blooming landscape illustrated on the card. This card features an outdoor scene with a bright blue sky, pure white clouds, lush green grass, yellow flowers as bright as the sun and a calm river flowing with purpose. All of these natural elements are used to show what can happen when you live a life of moderation and balance. When Temperance appears in a spread about your love life, it may be an indicator that you have found a partner who will help you achieve balance in your life. Consider what attracts you to your partner and what they bring out in you. Don’t forget to think about what you bring to the table and how you and your partner can help the other become whole. The balance and moderation signified by the Temperance card can be a very promising sign when it appears in a spread about your career. It may indicate that conditions are ideal for team projects and other cooperative ventures. If the Temperance card appears in your Tarot reading in its reversed position, it’s time to examine your life in great detail. What is keeping you from finding balance and moderation in your life? Whether it’s your personal habits, relationships or work practices, something is preventing you from living in harmony with your true life path. The Tarot card of Temperance is a positive card that is often a sign that you are on the right path to living a life of harmony. Let its appearance in your reading serve as a sign of encouragement to truly listen to your inner voice to find peace and harmony in your life. Previous What Does A Hanged Man Mean In Tarot? I Am Not A Psychic, Can I Read Tarot Cards?